It’s time to camp among the beautiful sandstone arches and desert landscape of Arches National Park! The vibrant red rock pressed against a bright blue sky is one of my favorite views in the National Park system, and the best part about camping in Arches is that you never have to leave the gorgeous scenery that you traveled so far to see. Numerous trails in the area provide some fantastic places to watch the sunset cast a rosy glow over the already colorful landscape. Reservations are required to stay in the campground from March 1 to October 31. No showers are available while camping in Arches. Each standard campsite only accommodates ten people. If you have a larger group, you will need to book two campsites or a group campsite. Dump stations and RV hookups are not available within Arches National Park. Firewood must be purchased from the camp host. Burning of collected wood is prohibited. Summer temperatures in Arches National Park can often be unbearably hot during the day. This area has very few trees and little to no shade and your tent will likely be in the direct sunlight for most of the day. I highly suggest bringing a canopy of some kind to create some shade in your site. Be sure to bring water bottles for every person in your group (preferably not disposable bottles). Arches National Park does not sell disposable bottles of water. This article contains information on the frontcountry camping experiences that are available within Bryce Canyon National Park. In other words, it covers places you can get to with your car! If you’re interested in hike-in backcountry camping options, click here. The Devils Garden Campground is located 18 miles from the Park Entrance. Drive along the Park Road until you reach the very end. The campground is on your right along the one-way loop in the Devils Garden area. 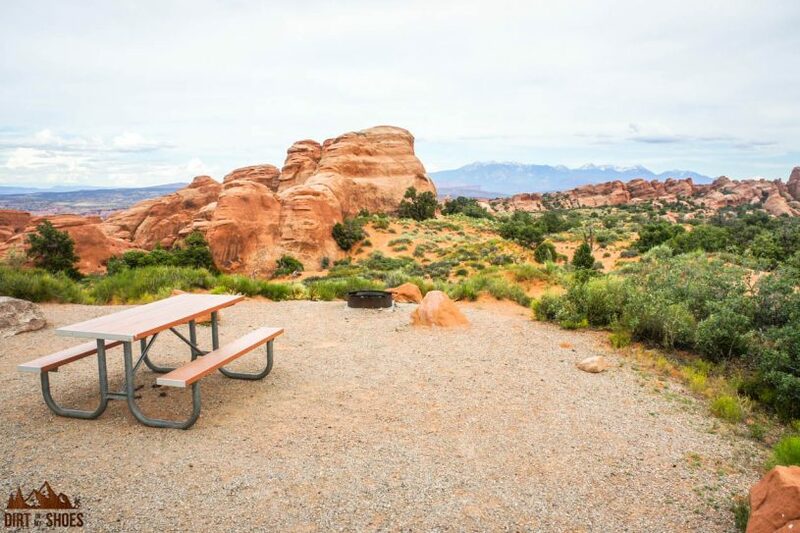 Based on how busy Arches National Park is, you may be surprised to find out that there is only one rather small established campground in the Park. If your vacation is between March 1 and October 31, click over to Recreation.gov to get a site. Sites are released 6 months in advance of the beginning date of your trip. If you are visiting during the off-season, all sites are first-come, first-served. Because Arches National Park only has one small campground, consider camping in a nearby campground in the Moab area if there is no availability. Check out this map to see other campground options in the area or go to this website for more information! Reservations Required: Yes for dates between March 1 and October 31. Click here to check availability. Now that you’ve taken a look at your camping options, are you ready to make sure you don’t miss any of the best sights in the park? Click NEXT to learn about the 10 things you can’t miss on your first visit! Thanks for the info. I’m considering renting an RV and heading that way as a special bday gift to my daughter. It is about a 3 hour drive and I’m concerned about not finding a place since we are now at the first come, first serve months not to mention it being a holiday weekend. Can you tell me if it typically fills up around thanksgiving and if so, another close by RV spot with great views? I would first try to get a spot in the park as early as you can, but if nothing is available then you can likely find something along Highway 128. Have fun! Hi! Thanks for the info! We are planning to do some tent camping in the Arches in August. I am aware of the heat, we camped at Anza Borrego Desert before, but not with such high temps. Do you know which sites have some shade? Thanks! I’m sorry, I don’t specifically know which sites have shade. I will be camping in a tent in August. Is the Devils Garden Campground cooler (relatively) than the city of Moab? And when you say “HOT” do you mean over 100 in August? Yes, over 100! The Devils Garden Campground should be about the same as Moab temperature-wise. What Moab has going for it is there are a few campgrounds right on the river so you’d have an opportunity to cool down that way. Devils Garden doesn’t have anything like that around. Water is scarce in the park…and so is shade. Thanks for asking about it. Many people go into that area greatly underestimating how unforgiving the desert can be. Since you’re already thinking about it, I have no doubt that you would be prepared enough to enjoy yourself in either place! Hi, we have just booked a two-night stay in Arches in July with an RV. I suppose no hook-up means no air-con. If it is that hot, how do you keep the temperature in the camper bearable? Hi Clara, yeah it’s going to be hot! The only advice I can really give regarding your question is to try to park the RV so that the sun doesn’t beat directly into the windows. And also, you are definitely going to want to bring your own shade! If you can somehow rig a few tarps to shade your camper, that should definitely help. If you have a generator you could also buy a fan or two to plug in and circulate air. Hope that helps! Hi, we’re planning an overnight stay at this campground in September 2016. I’m just wondering if we have to book one the two RV sites or if we also can use one of the standard sites with out RV (25ft). Do you have any experiences with that? You should just be able to use one of the standard sites, but I would call the Arches Visitor Center (435) 719-2299 for more specific information regarding your stay!